Whole30-, Paleo-, and Vegan-friendly meal ideas. Like clockwork, fad diets take over the moment January rolls around. From Whole30 to Paleo and everything else in between, the month is all about a healthy reset. And while these diets may seem great in theory, the execution often tends to result in a few hiccups. Abiding by a truly healthy lifestyle is one thing, but sticking to it for the duration of a month—or even making it a lifelong change—is another. Between busy work/life schedules and committing to a proper meal-prep routine, things can get challenging, and a loss of motivation is all too common. That’s where we come in, here to serve you with a mouthwatering roundup of healthy and hearty recipes to inspire your busy weeknight meals in the weeks to come. Cauliflower is all the rage these days, especially when featured in whole-roasted form. Minimalist Baker’s rendition features only five ingredients and is served with a refreshing side of chimichurri. Simply omit the maple syrup for a Whole30-friendly meal. A two-ingredient gnocchi recipe may seem too good to be true, but it’s very real. This Paleo- and Whole30-friendly version from Paleo Gluten-Free Eats features coconut milk, spinach, and garlic dressing that really takes things to the next level. Going Paleo doesn’t mean cutting out all your breakfast favorites. A Saucy Kitchen’s take on eggs and waffles is the healthy, low-calorie meal your mornings were missing. When it comes to eating Whole30, sweet potatoes will be your best friend, especially when it’s in the form of toast. This one will instantly curb all your sugar cravings. Nothing says detox quite like a superfood bowl, and Half Baked Harvest’s version is about as indulgent as they come. Skip out on the grains to make this Korean-inspired dish a Whole30-compliant one. This one-pan dish makes for quite the satisfying replacement for the classic combo. Cauliflower rice is sauteed with marinated tomatoes and chicken stock, resulting in quite the flavorful combination. When kale and lettuce can only go so far, switch things up with Brooklyn Supper’s utterly delicious radicchio and roasted squash salad instead. Skip out on the maple syrup in the dressing (you don’t really need it anyway) for a Whole30-approved take. 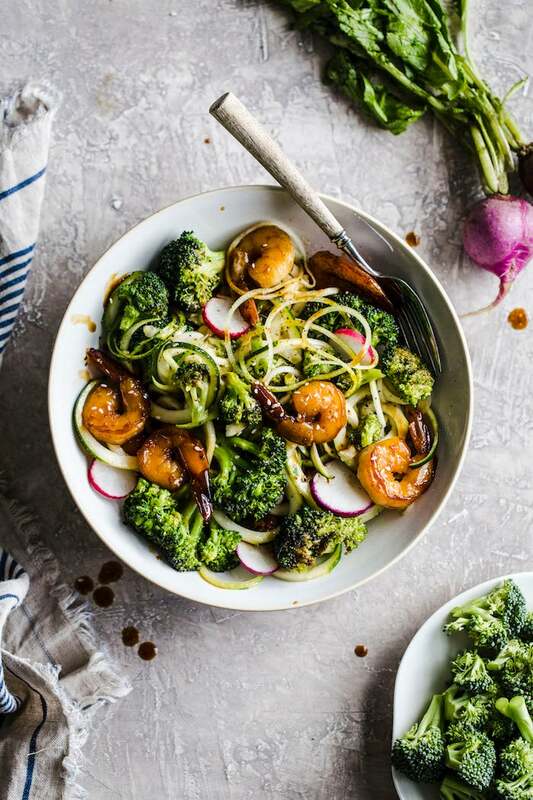 Make use of the season’s best ingredients with The Almond Eater’s refreshing take on a zucchini noodle bowl featuring sauteed shrimp and radishes. Baked sweet potatoes come paired with shredded chipotle chicken and dressed with a homemade ranch, all of which are entirely Whole30- and Paleo-friendly. Taco Tuesday gets a healthy spin with this wholesome take from The Almond Eater. Seasoned with cajun and topped with an avocado dressing, it’s about as satisfying as it gets.